In 1991, there were a number of aircraft broker dealers conducting business in ways that were less than completely ethical. Several concerned individuals in the industry joined together to address the lack of standards and issues. Robert Duncan was among them. "There were a lot of things happening that affected the ability of honest broker dealers to conduct business in the aircraft-resale market. We knew we had a stronger voice if we band together and formed an association," Robert says. 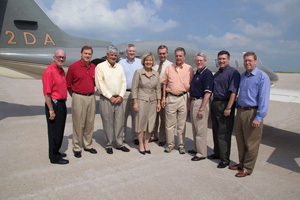 The founders of NARA (pictured in 2004 left to right) Robert Duncan, John Foster, Jack Prewitt, Dan Dickinson, Susan Sheets, James Markel, Johnny Gantt, Jerry Smith, Matt Huff and Johnny Foster. The National Aircraft Resale Association (NARA) was formed to establish a set of standards for member companies to follow that raised the ethical bar. Each company who joined promised to abide by a code of ethics and represent the best interests of their customers. Together, they formed a lobbying organization for the benefit of the general aviation industry. Every year since the association was formed, members of Duncan Aviation's Aircraft Sales team have remained actively involved. In 2010, Steve Gade, vice president of business development and marketing, was appointed to serve as the association chairman. "NARA gives a prospective client, whether buying or selling an aircraft, a safe and trusted place to conduct business," says Steve. It also gives associate members access to resources and services they may not have available in-house, such as insurance, legal and title. This great wealth of resources is a result of the network of NARA members.